Offering you a complete choice of products which include hydroponics turnkey systems. Growing food in the cosmos may represent the future, where astronauts, urban gardeners and home farmers alike, use hydroponics systems to grow food in small indoor spaces using a relatively controlled system. HiMedia brings these systems to your doorstep. 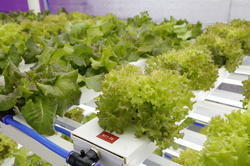 Looking for Hydroponics Systems ?